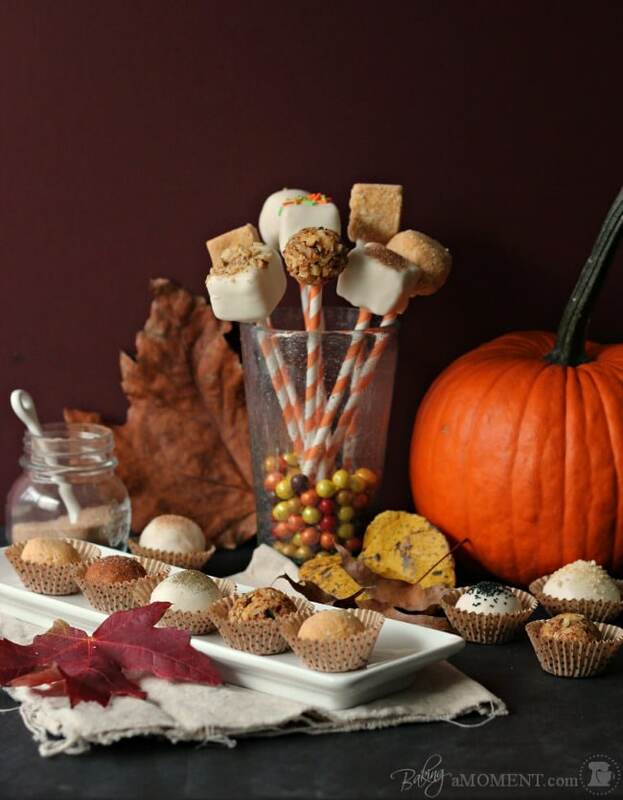 All the Best Fall Flavors in One Perfect Bite! Pumpkin and Cheesecake combine with White Chocolate, Chopped Nuts, Graham Crackers, and/or Gingersnaps for the Ultimate Fall nibble. This post is brought to you by none other than Mr. Allie. No, it’s not a guest post. No, he didn’t write the recipe. No, he didn’t take the photos either. He just hounded me mercilessly until I made this for him. I’m kidding. No I’m not. Mr. Allie, like everyone else on the internet (or so it seems, anyway), has a deep and abiding love for pumpkin desserts. Me? I could take ’em or leave ’em. One per year is plenty for me. And, I hope I’m not saying something that offends you, if you’ve posted and/or baked scads of these types of recipes, but, the idea of pumpkin + chocolate is so off-putting to me. Am I alone? I think I may be alone on this one. Please don’t hate me for that. Here, have a pumpkin cheesecake truffle. Better? … or, if you must, mini chocolate chips, melted chocolate, or cocoa powder. Heavy sigh! assorted toppings such as crushed cookies, chopped nuts, cinnamon sugar, sprinkles, etc. Preheat the oven to 350 degrees F, and lightly grease an 8x8 baking dish. In a large mixing bowl, beat the cream cheese and sugar together until smooth. Mix in the pumpkin puree and yogurt. Scrape the bottom and sides of the bowl with a rubber spatula. Stir in the eggs, one at a time. Scrape the bottom and sides of the bowl. Add the flour, vanilla, and spices, and blend to incorporate. Place filled pan in a larger baking dish, in the center of the oven, and fill the larger dish with about an inch of water. Bake for 45 minutes, or until set in the center. Turn the oven off, crack the door, and allow the cheesecake to cool in the warm oven for an hour. Carefully flip the cheesecake out of the pan, onto a cutting board. 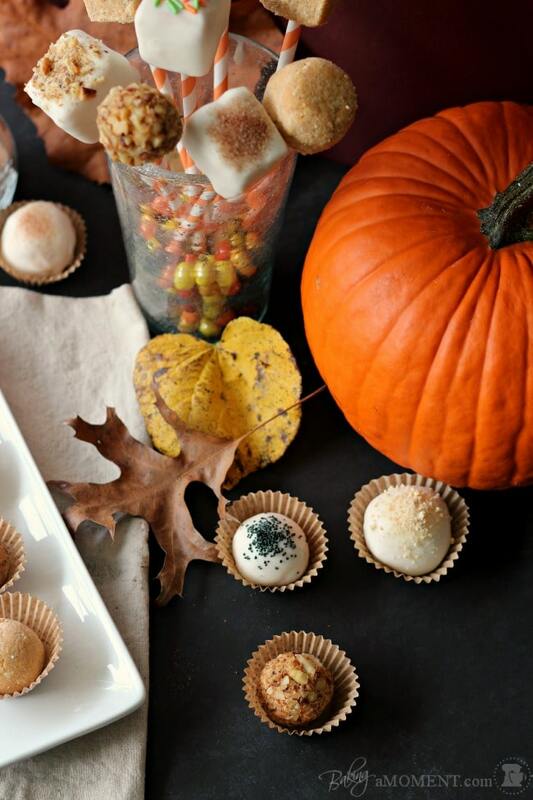 Coat the cheesecake truffles in assorted toppings, and insert a paper straw to make a pop. The cinnamon, nutmeg, cloves, and allspice can be replaced with 1 teaspoon pumpkin pie spice. If you are going for a little more sophisticated presentation, omit the sticks and call them truffles! I think a little edible gold leaf or glitter makes them stunning, and totally gift-able! Thanks for the great idea, Mr. Allie! I’m sure everyone on the internet will love ya for it! 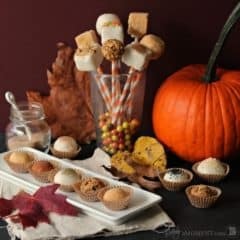 Mr. Allie was totally right to hound you into making these lovely truffles 🙂 I’m a bit of a pumpkin fiend so these look right up my alley–especially with all those fun toppings! Pure genius! Amazing pictures! Hope I didn’t hound you too bad, just thought it’d be a good idea for this time of year. I think it was a great idea! Just kidding around, you know 😉 You can see by the other comments here that everyone loves it. Perfectly seasonal! My Hubby is like me – doesn’t care much about pumpkin. 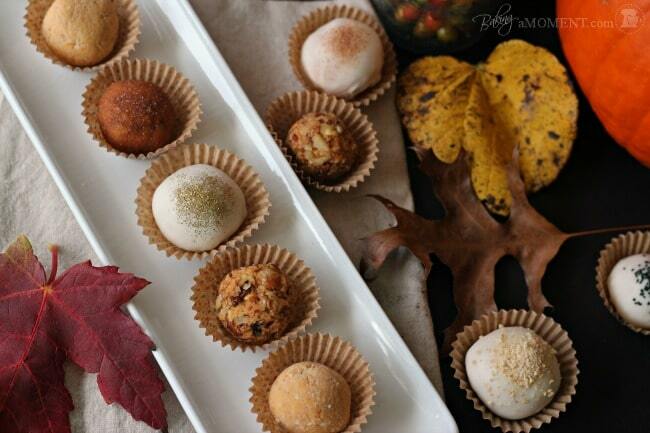 But these pumpkin truffles are so adorable! Love the fall setting, Allie! Uhmmm, Mr Allie is a genius!! What a great idea. I love these cute truffles and pumpkin + cheesecake is just amazing. I had some pumpkin cheesecake ice-cream last night and I was in love. SO I’m sure these little guys will pair well with that. Your pictures and presentation are beautiful!! Allie, you are perfect. These are going to be featured in a magazine someday, I just know it! It was my pleasure, Kelly! I had a lot of fun setting up that little vignette to photograph, with all the props from my front yard 😉 And I know, Mr. Allie always hooks me up with a great idea whenever I’m blocked. I think I’ll keep him, lol! 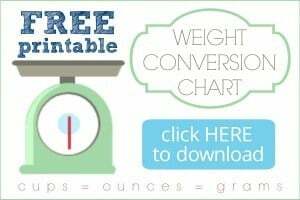 Thanks so much for sharing with your Pinterest followers! Hope you’re having a fabulous week, dear! Oh, my gosh, these look heavenly!!! Your photos are magnificent! Ha! You crack me up! I agree with you- I’m not so positive about pumpkin and chocolate. The only Pumpkin thing I like is Pumpkin Cake, which my high school art teacher would bring for each of our birthdays. It took me awhile to even try that, but once I did- woah, buddy! I was sold. I like that every fall. But that’s it. My husband on the other hand loves pumpkin everything! 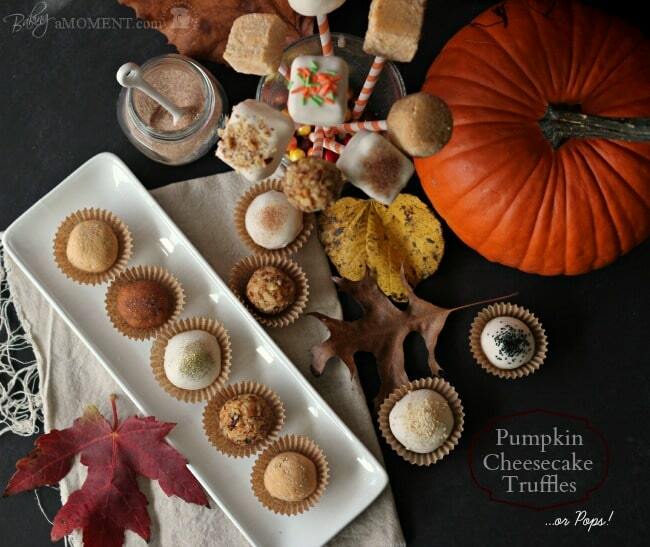 So, maybe I’ll be sweet and try some of these Pumkin Cheesecake Truffles for him because he LOVES cheese cake too! I LOVE pumpkin cake- and I love pumpkin + cream cheese. Last year I made a pumpkin loaf with a cream cheese swirl- it was so good! Thanks so much for reading, Emily, and I hope you’re enjoying this fabulous Fall weekend! That husband of yours is a smart man! I absolutely love pumpkin. I had lofty goals of baking a zillion pumpkin desserts this past month but only got around to one (sigh). Oh well, there’s still lots of fall left and plenty of holidays. 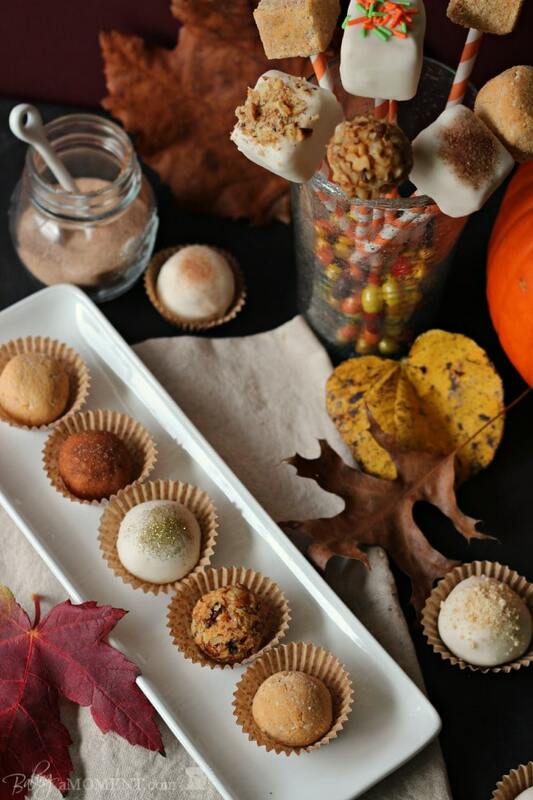 Your truffles look incredible and don’t even get me started on how lovely and beautifully styled your photos are. I know! I’m so happy I married a foodie, lol! I have a couple more pumpkin desserts to post but I have to be honest, I’m not all that gaga over pumpkin. I just know it’s what everybody else seems to want! Thanks for the sweet compliment, I had a lot of fun styling that shoot. Ya gotta love finding photo props on your front lawn, right? Take care, sweetie! These look great! So if making the truffles, just roll the squares into a ball, correct? Oh, if you haven’t made pumpkin bread pudding….you should! Your husband would love it! My husband would think he’d died and gone to heaven! Great idea, Lisa! And yes, just roll the squares into a ball. Or keep them square. It’s up to you! I started out thinking squares would be easier, but when it was all said and done I thought the balls actually were. You just have to roll them in graham cracker crumbs so they don’t stick. ♥ everything about this post!! thank you for sharing Hugs! 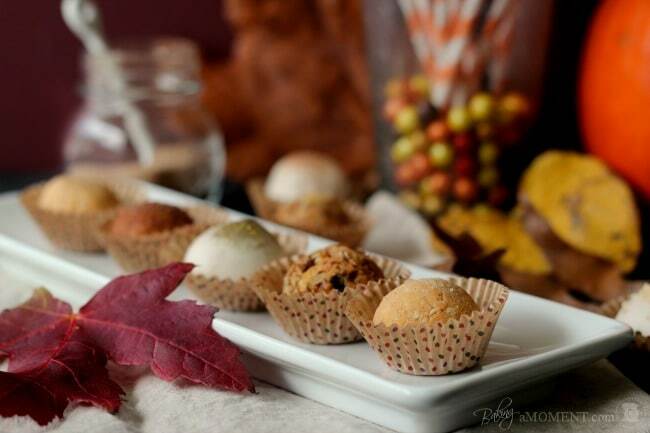 Did I miss something, or did you say if these pumpkin truffle balls should be refrigerated after they are made. How long can they stay on the table for guests before refrigerating again? Hi Gail! You’re right, the truffles will probably taste best cold. I’d say you could probably leave them out for a couple of hours. They won’t spoil too quickly or anything. They’re cooked through so the eggs aren’t raw. I think they’d be fine out for a couple hours on the dessert table, but ya, they do taste best if they’re cold. Just FYI, if you’re planning on rolling them in cinnamon sugar, you might notice they get a little wet on the bottom. The ones that held up best for me were the ones I dipped in white chocolate. Good luck, have fun, and enjoy! Pingback: Saturday Bloggers Showcase: Thanksgiving (Fall) Recipe RoundUp PLUS Show Us Yours Link Party!